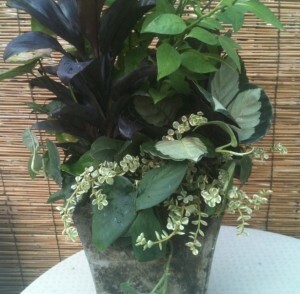 We Love Creating Great Container Combinations! Container gardening – putting together great combinations that are long lasting and beautiful is something we love to do! The planters here show groupings of houseplants (yes, you can use combinations of houseplants too!) 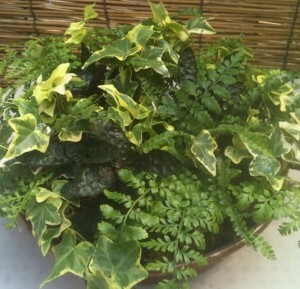 chosen for the variation of leaf color, shape and size…and perfect for a summer on a shady porch or patio. One is a loose, informal combination and the second arrangement is much more structured – see the difference? 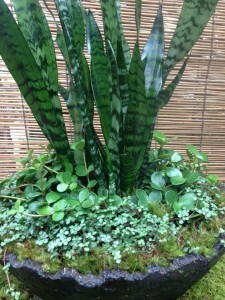 The last example is a small planter filled to the brim (don’t be skimpy with your plants!) and designed to be seen on a table or shelf. We’ll continue to showcase more container ideas to spark your imagination and creativity and help you choose the perfect combinations for your home and garden. We may be in the middle of winter now, but spring is fast approaching and we want you to enjoy creating your own container gardens – or, if you’re in the area we’re always glad to help. Happy planting! This entry was posted in Arrangements, Container and tagged arrangements, container gardening, containers, houseplants, Indoor plants, planters on January 31, 2013 by Kris Blevons.